Our brother Jason, who is a serious foodie, made the most amazing pie for the fourth of July! 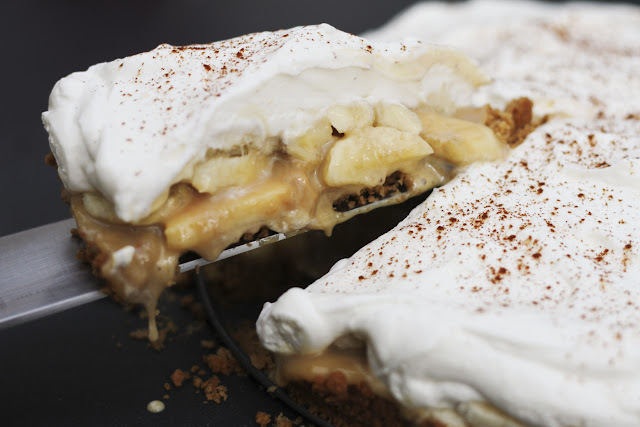 The base was a buttery graham cracker crust that was then spread with a layer of creamy toffee and loaded with fresh bananas and topped with heaping piles of sweetened whipped cream! We were all in heaven! The combination of flavors are a perfect match! So, of course I had to make it for a Barbecue we went to five days later! It's very simple, but will take some time because the secret is in how you cook the toffee! Thanks Jas for discovering this amazing pie! Enjoy everyone! First, take your can of sweetened condensed milk and put it in a sturdy sauce pan, completely covered with water. Bring the water to a continuous boil for 3 hours. Make sure to continue to add more water to the pan to keep the condensed milk completely covered. If even the top of the can starts to get exposed it could explode and you'd have half cooked toffee all over your ceiling! So watch it closely! Once the 3 hours is up, take the can out of the water and let it cool for an hour before opening! Second, preheat your oven to 350 degrees. Crush your graham crackers using a food processor or the way I do it, putting the crackers in a gallon ziploc and smashing them with a rolling pin. Put graham cracker crumbs into a large bowl and pour melted butter over the top. With a fork, mix together well. Then press evenly into the bottom of a springform or pie pan. Into the oven for 10 minutes. Remove and cool! 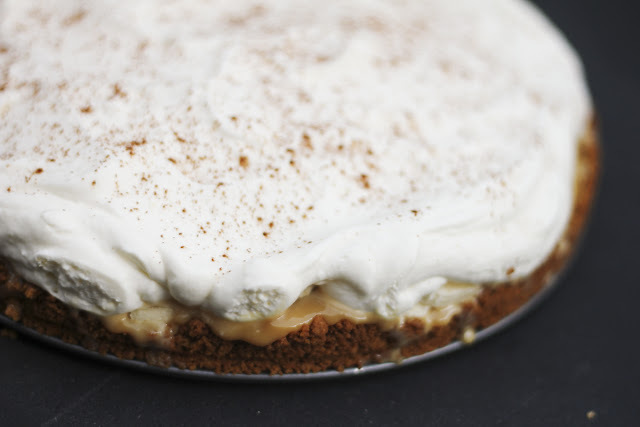 Third, open the can of cooled toffee and spread it over the graham cracker crust. Then slice the bananas and put the evenly on top of the toffee. Fourth, whip your heavy cream and add a few tablespoons of granulated sugar to taste. Dollop the heavy cream on top of the bananas and then sprinkle with a bit of ground cinnamon. Put the pie in the fridge to chill for an hour or so and then slice, serve and devour!!!!! This sounds SO good right now - thanks Jason! Too bad Lance is an idiot and doesn't like bananas - he's really going to be missing out on this one. Made this and it was as delish as you said. Super rich. Make sure to have a beverage near by. Thanks for the recipe.